Mr. Busarow holds a Bachelor of Music degree in Vocal Performance from Valparaiso University, a Master of Music degree in Choral Conducting from The Ohio State University, and Kodály Certification from the Kodály Institute at Capital University. 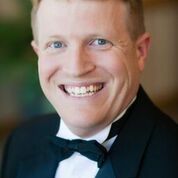 Mr. Busarow also serves on the faculty of Purdue University Fort Wayne where he teaches voice and choral music education. He has also served as the interim director of choral studies at IPFW and Valparaiso University. Mr. Busarow serves as the choir director at Emanuel Lutheran Church in New Haven, IN. Mr. Busarow is in frequent demand as a clinician and as a tenor soloist. He has conducted at the American Choral Director’s Association National and Regional Conferences, the Association of Lutheran Church Musicians, the Indiana Music Educators Association Convention, and the Bach Institute at Valparaiso University. Mr. Busarow serves as the Reading Session Chair for the American Choral Directors Association Central Division Conference. In 2015, he received the Arts United Award as the Emerging Leader. He lives in Fort Wayne with his wife, Nicole, and their children, Simon, Matthias, and Timothy.